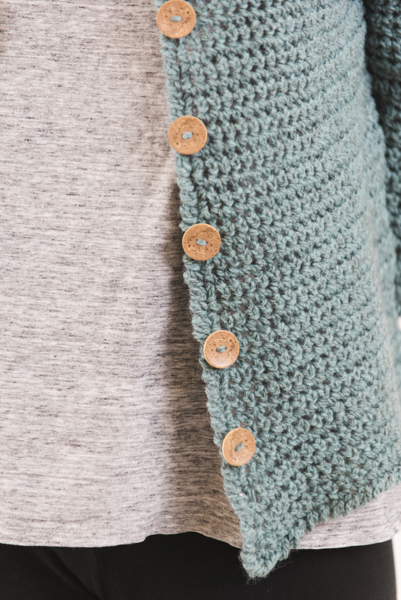 Buttons, three-quarter-length sleeves and a loose fit — this cardigan is just what the bookworm ordered. It’s even easy and fast to make for a newbie, so you can return to curling up in your cozy corner with your Jane Austen novel once it’s done. Row 1: Ch 1, sc in each st to end. Crab Stitch: *Insert hook in next st to the right, yo, pull up a lp, yo, draw through both lps on hook; rep from * around. The RS and WS of this garment look identical. To easily tell them apart, place a removable marker in the fabric at the beginning of the RS rows. Move this marker up as you work, so it can easily be seen. This sweater is worked from the top down. 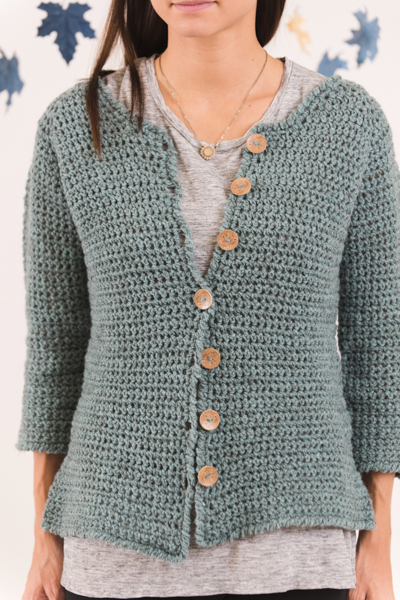 The yoke is worked from the neckline, with increases at 4 markers for raglan lines. At the underarm, the body and sleeves are separated. The body is worked down, then the sleeves are worked back and forth in rows and seamed closed. The trim is worked all around the edge of the body. Wet-blocking your swatch before checking gauge is essential for the proper fit of this garment. This stitch pattern, worked with a thin yarn and large needle combination will stretch and loosen up when blocked. To wet-block soak your swatch in cool water until it’s saturated. Roll it in a towel and squeeze out any excess water, then lay it flat to dry. Measure gauge once the swatch is completely dry. 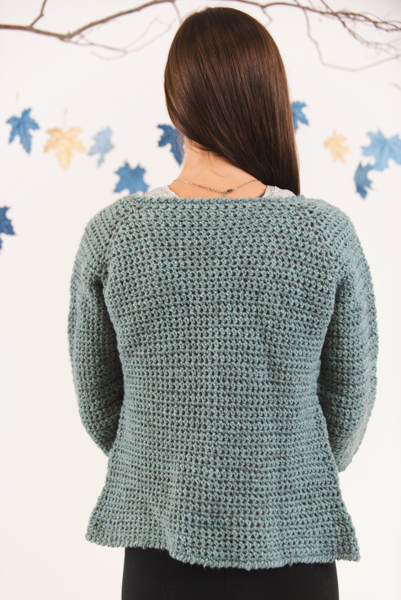 When your sweater is complete, wet-block the sweater using the same technique. Loosely ch 35 (37, 37, 41, 41, 43, 45), turn. Set-Up Row (WS): Sk first ch, sc in next 2 ch, pm in loop on hook, sc in next 7 (7, 6, 7, 6, 6, 6) ch, pm in loop on hook, sc in next 16 (18, 20, 22, 24, 26, 28) ch, pm in loop on hook, sc in next 7 (7, 6, 7, 6, 6, 6) ch, pm in loop on hook, sc in next 2 ch for Front, turn – 34 (36, 36, 40, 40, 42, 44) sc; 2 sc each Front, 7 (7, 6, 5, 6, 6, 6) sc each Sleeve, 16 (18, 20, 22, 24, 26, 28) sc for Back. Note: After each row, the markers fall in the first st of each section. Note: After working all sts as indicated in the marked st, replace the m in the loop on the hook, to mark the first st of the following section. Neck, Body and Sleeves Inc Row (RS): Ch 1, *work 2 sc in next sc, sc in each sc to marked sc, work 2 sc in marked sc, replace m; rep from * 4 more times, sc to last sc, work 2 sc in last sc, turn—10 sc inc’d; 4 sts each Front, 9 (9, 8, 9, 8, 8, 8) sts each Sleeve, 18 (20, 22, 24, 26, 28, 30) sts for Back. Body and Sleeves Inc Row (WS): Ch 1, *sc in each sc to marked sc, work 2 sc in marked sc, replace m, work 2 sc in next sc; rep from * 3 more times, sc in each sc to end, turn—8 sts inc’d; 5 sts each Front, 11 (11, 10, 11, 10, 10, 10) sts each Sleeve, 20 (22, 24, 26, 28, 30, 32) sts for Back. Rep the last 2 rows 3 (3, 2, 2, 2, 2, 2) more times – 106 (108, 90, 94, 94, 96, 98) sts; 14 (14, 11, 11, 11, 11, 11) sts each Front, 23 (23, 18, 19, 18, 18, 18) sts each Sleeve, 32 (34, 32, 34, 36, 38, 40) sts for Back. Remove loop from hook, and elongate loop so it doesn’t unravel. With another ball of yarn, ch 2 (3, 5, 6, 7, 8, 9), sl st in the first st of the last row worked (beg of WS row). Fasten off. Next Row (RS): Tighten elongated loop around hook, ch 3 (4, 6, 7, 8, 9, 10), sk first ch, sc in next 2 (3, 5, 6, 7, 8, 9) ch, *sc in each sc to marked sc, work 2 sc in marked sc, replace m, work 2 sc in next sc; rep from * 3 more times, sc in each sc to end of front, sc in each of the 2 (3, 5, 6, 7, 8, 9) ch, turn – 118 (122, 108, 114, 116, 120, 124) sts; 17 (18, 17, 18, 19, 20, 21) sts each Front, 25 (25, 20, 21, 20, 20, 20) sts each Sleeve, 34 (36, 34, 36, 38, 40, 42) sts for Back. Next Row (WS): Ch 1, *sc in each sc to marked sc, work 2 sc in marked sc, replace m, work 2 sc in next sc; rep from * 3 more times, sc in each sc to end, turn – 126 (-, 116, 122, 124, -, -) sts; 18 (-, 18, 19, 20, -, -) sts each Front, 27 (-, 22, 23, 22, -, -) sts each Sleeve, 36 (-, 36, 38, 40, -, -) sts for Back. Next Row (WS): Ch1, sc in each sc to end, turn. Body and Sleeves Inc Row (RS): Ch 1, *sc in each sc to marked sc, work 2 sc in marked sc, replace m, work 2 sc in next sc; rep from * 3 more times, sc in each sc to end, turn – 124 sts; 19 sts each Front, 24 sts each Sleeve, 38 sts for Back. Next Row (WS): Ch 1, sc in each sc to end. Body and Sleeves Inc Row (RS): Ch 1, *sc in each sc to marked sc, work 2 sc in marked sc, replace m, work 2 sc in next sc; rep from * 3 more times, sc in each sc to end, turn – 8 sts inc’d; 134 (130, 132, 130, 132, 128, 132) sts; 19 (19, 20, 20, 21, 21, 22) sts each Front, 29 (27, 26, 25, 24, 22, 22) sts each Sleeve, 38 (38, 40, 40, 42, 42, 44) sts for Back. Body Inc Row (WS): Ch 1, *sc in each sc to marked sc, work 2 sc in marked sc, replace m, sc in each sc to next marked st, sc in marked st, replace m, work 2 sc in next st; rep from * once more, sc in each sc to end – 4 sc inc’d; 138 (134, 136, 134, 136, 132, 136) sts; 20 (20, 21, 21, 22, 22, 23) sts each Front, 29 (27, 26, 25, 24, 22, 22) sts each Sleeve, 40 (40, 42, 42, 44, 44, 46) sts for Back. Rep the last 2 rows 1 (2, 3, 4, 5, 6, 7) more times – 150 (158, 172, 182, 196, 204, 220) sts; 22 (24, 27, 29, 32, 24, 27) sts each Front, 31 (31, 32, 33, 34, 34, 36) sts each Sleeve, 44 (48, 54, 58, 64, 68, 74) sts for Back. Next Row (RS): Ch 1, sc 22 (24, 27, 29, 32, 34, 37) for Front to m, remove m, ch 4 (6, 6, 8, 8, 10, 10), sk next 31 (31, 32, 33, 34, 34, 36) Sleeve sts and beg in st after the next m, remove m, then sc in next 44 (48, 54, 58, 64, 68, 74) sts for Back to next m, remove m, ch 4 (6, 6, 8, 8, 10, 10), sk next 31 (31, 32, 33, 34, 34, 36) Sleeve sts and beg in st after the next m, remove m, then sc in next 22 (24, 27, 29, 32, 34, 37) sts for Front to end, turn – 96 (108, 120, 132, 144, 156, 168) sts. Next Row (WS): Ch 1, *sc in each sc to ch sts, sc in each of the first 2 (3, 3, 4, 4, 5, 5) ch sts, pm in loop on hook, sc in the following 2 (3, 3, 4, 4, 5, 5) ch sts; rep from * once more, sc in each sc to end, turn – 24 (27, 30, 33, 36, 39, 42) sts each Front and 48 (54, 60, 66, 72, 78, 84) sts for Back. 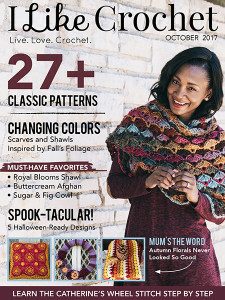 Note: Cont to replace m on each row, in the loop on the hook, after working in the marked st.
Dec Row (RS): Ch 1, *sc in each sc to 2 sc before marked st, sc2tog, sc in marked st, replace m, sc 1, sc2tog; rep from * once more, sc in each sc to end, turn – 4 sc dec’d; 92 (104, 116, 128, 140, 152, 164) sts rem. Next 5 Rows: Ch 1, sc in each sc to end, turn. Rep the last 6 rows 2 more times – 84 (96, 108, 120, 132, 133, 156) sts rem. Inc Row (RS): Ch 1, *sc in each sc to 1 sc before marked st, work 2 sc in next sc, sc in marked st, replace m, sc 1, work 2 sc in next sc; rep from * once more, sc in each sc to end – 4 sc inc’d; 88 (100, 112, 124, 136, 148, 160) sts. Next 7 Rows: Ch 1, sc in each sc to end, turn. Rep the last 8 rows twice more, removing side markers after the last inc row – 96 (108, 120, 132, 144, 156, 168) sts. Place 7 removable markers along the right front edge for buttonhole placement. The first about ½” / [1.27 cm] below the Front neck, and the rem 6 evenly spaced to about 1-2″ from lower edge. Rnd 1 (RS): Ch 1, sc in each sc to last sc in row, do not turn, work 3 sc in last sc, rotate to work along the Right Front edge, work 1 sc in the end of each row evenly along the Right Front to first buttonhole m, ch 2, sk next 2 sts to make buttonhole; rep from * for each m, cont to work 1 sc in each row to neck. At corner of neck, work 3 sc in the corner, 1 sc in each st and each row evenly around the neck to the corner of the Left Front neck, work 3 sc in the corner, 1 sc in each row evenly down the Left Front to the lower corner, work 3 sc in the corner, 1 sc in each sc evenly along lower edge of the Body to corner of Right Front, work 2 more sts in the st where the first st of the rnd is worked, join with sl st.
Rnd 2: Work Crab St evenly around, working 2 sts in each ch-2 sp for buttonholes. Fasten off. With RS facing, join yarn with sl st at center of underarm, ch 1, sc in next 2 (3, 3, 4, 4, 5, 5) sts, sc in next 31 (31, 32, 33, 34, 34, 36) sts, sc in next 2 (3, 3, 4, 4, 5, 5) sts to end, turn – 35 (37, 38, 41, 42, 44, 46) sts. Next Row (WS): Ch 1, sc in each sc to end, turn. Dec Row (RS): Ch 1, sc in next st, sc2tog, sc in each sc to last 3 sc, sc2tog, sc in next st, turn – 2 sts dec’d; 33 (35, 36, 39, 40, 42, 44) sc rem. Next 9 (7, 7, 5, 5, 5, 3) rows: Ch 1, sc in each sc to end, turn. Rep the last 10 (8, 8, 6, 6, 6, 4) rows 0 (2, 2, 2, 2, 2, 0) more times – 33 (31, 32, 35, 36, 38, 44) sts rem. [Rep Dec Row, work 11 (9, 9, 7, 7, 7, 5) rows even] 2 (1, 1, 2, 2, 2, 5) times – 29 (29, 30, 31, 32, 34, 34) sts rem. Work 2 more row even. Fasten off.